Epiphyllum cactus or are often called Orchid Cactus or Jungle Cactus. 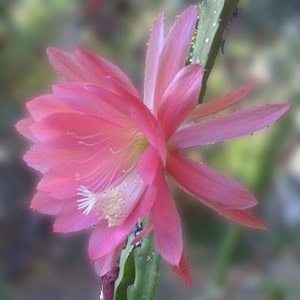 One of the most popular of this species is Epiphyllum Oxypetalum (syn Cereus oxypetalus) also known as ‘Dutchmans Pipe’ and ‘Queen of the night cactus’ a strong perfume and of course night flowering. Epiphyllum care is not difficult, they grow well in hanging baskets warm position with strong but filtered light. Propagation of Epiphyllums is easy, a stem cutting is taken and allowed to dry or cure for 2-3 days and then planted into a well drained cactus potting mix. In the cooler months keep the cutting fairly dry and commence watering in spring to summer. Epiphyllums prefer temperatures around 25°C. However they will do well in temperatures above this if given some shade. Humidity of 50% is great for most . Try a position in a protected area but with good air flow. A free draining open potting mix is best, but remember epiphyllums like to be kept moist, but not wet. Epiphyllums can be grown indoors in a pot on a windowsill, but protect from hot sun. A seaweed based fertilizer is suitable for Epiphyllums.